Going back to Godhead means to reach life's ultimate goal. We often use this term when talking about the return of the self—atma—to its original and permanent home in the spiritual world. Godhead means the divine, spiritual nature of the Supreme Person, Krishna, the ultimate source of all energies. It also refers to the kingdom of God, a luminous, ecstatic spiritual environment where everyone is extremely happily living with Krishna in varieties of loving relationships. This spiritual world is the soul's natural environment. The practice of bhakti-yoga helps to reawaken our normal, spiritual consciousness, and prepares us to re-enter the spiritual world, go back to Godhead. In the Bhagavad-gita, Krishna says that anyone who understands and loves Him goes back to Godhead, never to return to the material world. Crow And Tal Fruit Logic - whether we live in the material or spiritual world depends on where we are "at" in terms of our mentality. - for us to go "back" to Godhead, we must be from there. So how did we get here? "Amongst all of the planets in the spiritual sky there is one supreme planet called Goloka Vrindavana, which is the original planet in the abode of the original Personality of Godhead Sri Krishna. All of this information is given in Bhagavad-gita, and we are given through its instruction information how to leave the material world and begin a truly blissful life in the spiritual sky." 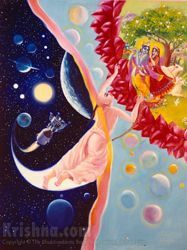 "The Lord resides eternally in His abode Goloka, yet He can be approached from this world, and to this end the Lord comes to manifest His real form. . ."
"The all-merciful Lord is always mindful of our difficulties in the mundane world, and He is more eager to get us to return home, back to Godhead, than we are eager to go." "That supreme abode of Mine is not illumined by the sun or moon, nor by ﬁre or electricity. Those who reach it never return to this material world." "As long as a living entity is in this dark material world, he is in conditional life, but as soon as he reaches the spiritual sky by cutting through the false, perverted tree of this material world, he becomes liberated. Then there is no chance of his coming back here." Why doesn't Krishna just bring everyone back to Vaikuntha?